Looking for the perfect garden shed? You've found it right here at Trade Tested. Our quality, high grade steel garden sheds are available in a wide range of sizes and colours, and are 100% rust proof with a 12-month no rust guarantee. When you order from Trade Tested, your new garden shed will be shipped promptly, easy to assemble, and manufactured according to industry standards. All our sheds are double pressed galvanised steel and built to last. 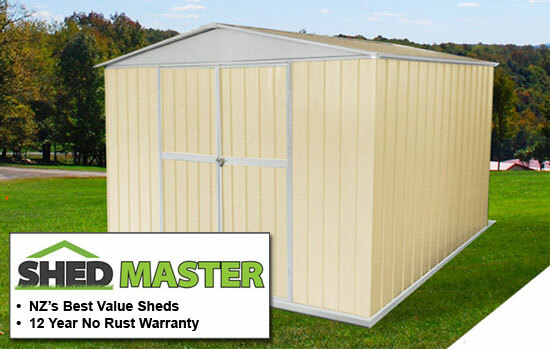 Because we are a direct-to-customer importer of the Shed Master steel garden shed, the savings are passed on to you, our customer. Why buy from us? Besides the fact that we offer the best customer service and the finest quality garden shed, we are an industry leader in outdoor storage. What does that mean to you? Instead of just being another dealer who can sell you a garden shed, we are fully knowledgeable and specialize in workshop sheds, greenhouses, and even outdoor equipment, such as wood chippers and generators. Because the outdoor equipment and garden shed is our industry, we are able to provide you with the products, service, and knowledgeable information you would expect. We proudly offer a 7 day refund policy for all products purchased from our Trade Tested website, and we don't stop there. We also back your outdoor storage and garden shed purchase up with a minimum 12-month parts and labour warranty. Trade Tested. We are your garden shed source!